In most cases of heavy psychosis, the patient feels proud for his actions enjoying their consequences. The Greek case after the result of its last referendum has been registered, which brought the country deep into disrepute and pushed it to the edge of economic and social catastrophe, is not distancing itself very much from the responsibility of psychiatry. A series of pictures have made the tour of the world showing high-spirited Greeks celebrating the ‘NO’ result of the referendum. At the same time the despicable former Greek Minister of Economics, Yanis Varoufakis, was directing his verbal Parthian arrows against the ‘hated’ lenders – blaming them in essence for fraud, blackmail and harshness. At the same time, however, the Greek leadership, in a state of panic, was rushing to Brussels for extracting from the ‘blackmailers’ and ‘political crooks’ a new economic agreement which would possibly salvage the Greek society from a unanimous drop out decision. 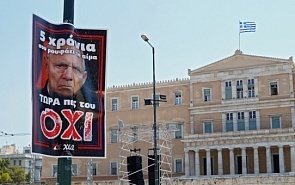 News coming from the home city of the EU and from Berlin insist on a profoundly negative anti-Greek atmosphere. "Eurozone officials", wrote Peter Spiegel of the FT, "have entrusted their lawyers to examine all EU legal texts to identify ways enabling the expulsion of Greece from the Eurozone". And he continues immediately afterwards: "Although Eurozone officials insist that there is little disposition to negotiate with Greece, the signs are that political leaders and bankers do not want to take the blame for a Grexit" (7 July 2015). Alarm bells are clearly ringing. Everyone is looking for an alibi for the imminent execution of Greece. The question does not appear to be in what way the country can be saved. But rather who will carry the blame for the final catastrophe. In the meantime, the ones responsible for the disaster, namely the voters and the NO propagandists, are celebrating dancing in town squares! Without the necessary liquidity from the ECB coffers, after of course a guarantee obtained from the Eurozone, the Greek banks will remain firmly closed. Cash will entirely disappear, salaries will be impossible to disperse, businesses will shut down, and goods will disappear from shops and supermarket shelfs. The excuse of the democratic procedure that justifies the Greek stand does not cut much ice with the lenders. Voting in favor of receiving funds from other nations without accounting for their use, does not in itself reflect respect for democratic procedures. How would the others, whose money you request, vote if a similar question was put to them? Slovakia has already hinted at conducting a referendum questioning the desirability of granting Greece new bailout money. Would they decide against such an option, which democratic sensitivities would weigh more? This is where the country has been led by short-sighted so-called revolutionaries, by pretending imitators of real life, by flamboyant theoreticians of the concept of nothing and by the fanatics of absolute stupidity. May the Lord look mercifully upon us…?